The whole world knows Hildebeast Clinton had a serious medical incident on September 11th. There's no question about it as video now watched by millions captured her at the sidewalk in a bad state where she literally went into a header and was then thrown into her medically equipped van. We know Mrs. Clinton was not taken to a hospital but rather opted to have her van drive right by the nearest hospital to her daughter's $9,250,000 apartment. Does that make any sense to you? A female with well documented medical problems literally drops at the open doors of her medically equipped travel van and instead of taking her to the nearest hospital she goes to her daughter's place of residence? Much has been made regarding another former tenant in the same building, Metro Home Services, Inc. Lots of claims it is a medical care provider there for Clinton. However, when that company was in business their patients were seen off site at facilities. In 2013 MHS had merged with another and the new owners officially put out notification deluxe apartments would be available in the near future. Besides Chelsea's apartment there are two others plus one deluxe condo. Those are the occupants. That's not to say some medical equipment might be housed in Chelsea Clinton's apartment to accommodate her mother and her myriad of medical problems. Only those who have ever been inside know the truth. In January 2000 I took my friend, Bill Benson, to the airport in Sacramento. The airport was absolutely packed. The line for Bill's flight to Illinois was over 200 people. Bill was in a wheel chair so I stood in line with everyone hacking their brains out. Coughing, blowing noses. It was miserable to say the least. The next morning I woke up I couldn't breathe. I thought I was going to die. My late husband took me to UC Davis Medical Center ER while I waited 5 HOURS to see a doctor suffering the whole time. Incidentally, two Sacramento Kings players came in the ER (John recognized them being a fan). They waited five minutes and were sent in to see a doctor. I was not happy over that. Anyway, the doc thought I had pneumonia, ordered chest x-rays, etc. Yep, I had it; got the prescription for antibiotics. For the next 10 days I suffered like a dog. Couldn't breathe, just miserable. No way I could go to a big event two days after the ER like Hildebeast did at the 9/11 memorial. I could barely breathe never mind walk around or stand for more than two minutes at a time. I was 51 then and in perfect health (and thankfully still am). She is 68. Now, Hildebeast supposedly was diagnosed two days prior to the 9/11 remembrance. Given antibiotics. Two days later after less than 40 minutes at the ceremony we see what happened. Is it not totally irresponsible to go into a crowd of people with her coughing problems and pneumonia? Not to mention she went straight to Chelsea's apt after leaving the ceremony with a toddler and baby in residence. Upon decamping from Chelsea's apartment, Hillary makes hay by inviting a little girl over so she can breathe all over that child while waving and telling everyone she was just hunky dorey. If you haven't seen the clip of 'Hillary' leaving Chelsea's apartment, here it is. Would Dr. Bardack jeopardize her medical career to lie for Hillary? When I first started reading and watching videos about Clinton using a body double I wasn't convinced. Yes, we know heavy hitters whether they are banking magnates, dictators like Saddam Hussein who was known to use at least half a dozen look a likes, Osama bid-Ladin did the same which conveniently kept him 'alive' after his death in 2001 because he was worth more political capital and endless cash cow revenues for mega corporations who profit from war to Winston Churchill to LBJ. So, it's not uncommon. Certainly there appeared to be differences in the Hillary that left the 9/11 remembrance to the person coming out of Chelsea's apartment. Most noticeable were the size of her thighs. Clinton hides her, how shall I say...chunky thighs by wearing pants suits 100% of the time in public and voluminous tents while on vacation in the toney Hampton's. The woman coming out of Chelsea's apartment from several different angles looks very much like her so I wasn't convinced. However, after plowing through everything on the Internet, sigh, the woman coming out of Chelsea's apartment definitely is not only about 25 pounds or so lighter (especially the thighs) but she also looks slightly shorter than Hildebeast. Clinton is 68 years old. 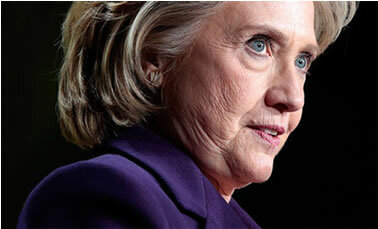 In many photos one can clearly see she has her share of wrinkled skin and what fashion mavens call a 'turkey neck'. The woman coming out of Chelsea's apartment building has smoother skin and a fairly smooth neck; I used my oversize magnifying glass. As for there not being any secret service around that simply isn't true. There are several videos which show SS but not too close to her. I suppose because Clinton is a frequent visitor to her daughter's and most of the media didn't know where she was going, they didn't feel the need to surround her. You can also see in the clip linked above at the apartment it appears the crowd is being contained a distance from her. There's a woman named Teresa Barnwell, a Hillary look alike who allegedly makes $10,000 a month impersonating her. Clearly she is not in any of the photos or video clips since the 9/11 incident. Quite honestly I don't see much of a resemblance myself and Ms. Barnwell has responded on-line that she was in California during Hildebeast's medical emergency. The one thing that changed my mind was a voice comparison. I want you to go listen to this video clip. Allegedly it's Hillary one day following the 9/11 event. The first 1:08 seconds is Clinton spewing provable lies about Donald Trump to CNNs Anderson Cooper. Her voice is the voice we all can recognize. Hildebeast has a slight grading to her voice. It's very distinctive and annoying. Then compare it to the voice, not a visual, which comes next in that short clip. Allegedly the voice belongs to Hillary Clinton but it does not. Clearly, the voice is much deeper, lacks that slight grading noise and simply isn't her in my humble opinion. There is something wrong here. In order to pull off a body double those closest to Clinton would have to be involved in the cover up. Secret Service agents who have been assigned to her since April 2015 would surely notice if their protectee lost 25 pounds in 90 minutes. They've heard her speak. The same goes for her entourage and staff. One would think the SS agents would speak out and say, what's going on here? IF Clinton is using a body double (there's no doubt in my mind she used a voice double) then the American people regardless of party affiliation have a RIGHT to know. Here is a photo array you can judge for yourself. There's no question, despite all the screeching to the contrary, Hillary Clinton is one sick person who absolutely would be unable to function full time as president. It would be the only reason to use a body double. Clinton is desperate to hide the truth about her medical problems and she will go to ANY lengths to fool the American people. "One of the biggest bombshells in the leaked Colin Powell emails is the news that Democratic senator Sheldon Whitehouse informed a Democratic donor that Hillary's health is so bad that she “could barely climb the podium steps” during an event they both attended. “Sheldon Whitehouse, who is a huge Clinton supporter, said they were both giving speeches at the same event a few months back and she could barely climb the podium steps,” Democratic financier Jeffery Leeds said in an email discussion with George W. Bush's former secretary of state." It goes on to show the emails were dated March 14, 2015. On April 12, 2015 Hildebeast announces she's running. For obvious reasons Donald Trump should NOT make this an issue. I believe it was Megyn Kelly last week who touched on this - could have been another anchor - but as usual, it was treated the same way FOX treated Obama's citizenship issue: with laughs and ha, ha's. This is no laughing matter. 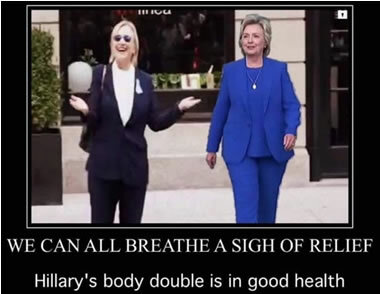 The voters have a right to know the full truth about Clinton's health and if she's using a body and/or voice double - BEFORE she steps on the stage for the first debate September 26th against Donald Trump. Devvy Kidd authored the booklets, Why A Bankrupt America and Blind Loyalty; 2 million copies sold. Devvy appears on radio shows all over the country. She left the Republican Party in 1996 and has been an independent voter ever since. Devvy isn't left, right or in the middle; she is a constitutionalist who believes in the supreme law of the land, not some political party. Devvy is a member of the Society of Professional Journalists. 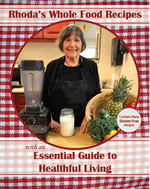 Devvy's regularly posted new columns are on her site at: www.devvy.com. You can also sign up for her free email alerts. We know Mrs. Clinton was not taken to a hospital but rather opted to have her van drive right by the nearest hospital to her daughter's $9,250,000 apartment. Does that make any sense to you?